I'm currently reading the Santa Rosa newspapers from early 1906 -- or rather, trying to. The microfilms are so badly scratched and faded that many pages are illegible because of interest in the Great Earthquake that happened in April. It's a loss that saddens because it was unnecessary; there's probably not much about the quake and its aftermath that's not already been hashed and rehashed in a shelf-full of books and articles. Parachuting directly into a particular event is also a lousy way to learn about history. Yes, the newspaper accounts of such a day will be rich in who-what-when, and there will be a thrilling immediacy in the telling -- but there will be little or no of the why or how behind the event. By analogy: What could be fresh and unique to discover in the Dallas newspapers from the day after Kennedy's assassination, aside from shocked reactions? If you really want to understand the event, better to settle in with a good history book on the Bay of Pigs. And if you want to learn about Santa Rosa or any other town, better instead to seek out articles like the one below. There's hardly any news value in it, and the piece isn't even well-written -- maybe it was a writeup of a presentation made by one of the women in the Saturday Afternoon Club; it reads better if you think of it as a speech to a civic group. Yet this little item about rambling around Santa Rosa's "South Side" is packed with valuable historic details. 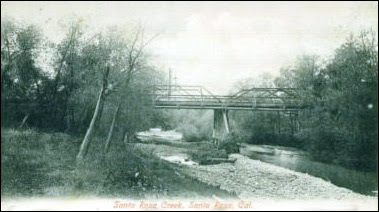 Santa Rosa Creek absolutely defined a north-south boundary for the town in the early 20th century, just as the freeway now creates an east-west barrier. 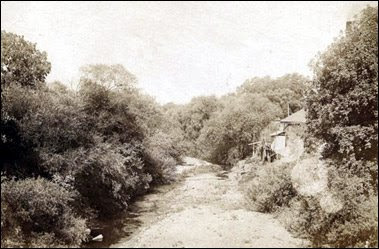 It was like a little river -- particularly west of South Main, where it was joined by Matanzas Creek -- but it wasn't just the body of water (or in sometimes in summer, dry creekbeds) that demarcated the old part of town from the "suburbs." There was also limited access across it; there were only four bridges that a rig or automobile could drive over in 1905. The banks were also abundant with trees and brush, presenting an imposing green wall blocking the view from either side. 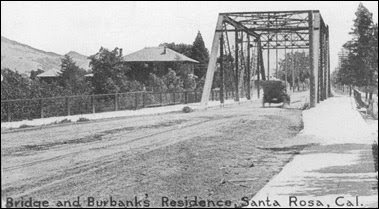 Burbank's home and gardens were right over the bridge at the corner of Sonoma Avenue, but south of that, the only things springing up for the next mile or so were cottages on tiny lots. The east side of South Main was already packed with houses; now builders were filling up the other side of the street. So rapidly was this part of town booming that this 1905 article mentions "Boswell street" (the author must have meant Bosley St.), which didn't even appear on a map from a year earlier. These were marketed to families "who are not able to buy homes which are very expensive," as the writer (rather indelicately) states. Most were around 1,000 sq. ft. or so; an earlier news article posted here describes the interior of a typical home. Some only had outhouses. The middle portion of this article may have been rewritten or otherwise punched-up by the newspaper to sell some of those houses. Although he was no longer editor, Santa Rosa Republican owner Allen Lemmon was still pushing lots in his "La Rosa Place" subdivision (available on the installment plan for $10/mo), and used to regularly fill space in the paper with oversized ads. Parts of the writing sound much like the sort of advert he often wrote. This author was also probably the first to state in print that "the Cotati road...will be the main road between here and Petaluma." Given that there were only 21 automobiles in town and one gas station, it was prescient in 1905 to describe that dirt road south as destined to be anything significant, particularly considering the well-established road south went first through Sebastopol. "Cotati road" eventually became Old Redwood Highway and is now Santa Rosa Ave, but as late as 1918 it was just a dirt road -- and the only stretch of dirt road along the route between Sausalito and Ukiah. Oh, how those early motorists must have looked forward to the Santa Rosa leg of their journey, particularly in the rainy season. Most significant in this article, however, is that it explicitly mentions Santa Rosa's "redlight district," which was at the intersection of 1st and D. More about the brothels in the following post. That Santa Rosa is soon the be a great city, and that of fine residences as well, is as certain that she is one of the most beautiful spots on the map to-day. A trip Tuesday through the suburbs of the city established this fact, and one has only to take a ride around through the additions on the South Side to conceive this same opinion. The number of new residences that have recently been erected there is an evidence that the people have confidence in that part of the city and are not afraid to put their money into good substantial houses, and attractive ones as well. Out Sonoma avenue were found many fine new residences and a number of homes that have been remodeled recently, making this one of the finest residence streets in the City of Roses. And the best of it all is that they have not finished there yet, for there are new residences being erected at the present time. The new water main is soon to be laid there, and the pipe is already on the ground for the same. From here a visit was made to Charles street and then to Boswell street, where the improvements were found to be on a little different plan, though carrying out the same idea of enterprise and improvement. In this part of the city the people are buyng their lots and erecting small but comfortable cottages which will make them good homes. This is especially true of some of the property owners there who are erecting the houses and then selling them to families who are coming here, and who are not able to buy homes which are very expensive. The most interesting feature of all in the south part of town is the opening up of the extension of A street across the creek. The street commences at the corner where the new grammar school is being built and extends from there south to the city limits, and there is a movement on foot now by some of the parties who are interested in the addition to bring the matter before the Board of Supervisors and have them open the street on through to the corner of the Cotati road. This will give an outlet on A street from the corner of Kopf & Donovan's store, on Fourth street, to the Cotati road on the south. The Cotati road, as all know, is destined to be the main road between here and Petaluma, and with this new street opened, and the bridge across the creek, as is proposed, there will be no reason why the people who are living south of the city should not have easy access to the City of Roses for their business center. A large number of the homes which are being erected on the lots in the subdivisions in the South Side, as it is so well named, are being paid for in the building and loan plan, and the loans are either made by private individuals who are able to assist, and thus make good investments for the capital as well. Another feature of the South Side which should be pushed, and which is to the advantage of the city, is the transforming of the creek banks from the corner of First street at the E street bridge along the creek to Main street, into a natural park. To do this will be necessary to remove all the redlight district, which is now located there, as well as the sheds and barns, but there could be no place within the boundaries of the City of Roses that would be such a natural park as these rustic banks of old Santa Rosa creek if they were cleaned up and beautified as they should be.